After many unsuccessful attempts to make my beloved baguette, that led to frustrations, I finally managed to make some that made me quite happy. My mom makes bread in a blink of an eye and her bread always turns out delicious, without really any need for it, since they are surrounded by amazing boulangeries (bakeries). I figured being in a “non-baguette” land, I needed to be able to make them, and there was no question about it. I was determined to try as many time as necessary, you cannot just stop at a few failures, can you? I was determined to never give up trying even if it would take me months or years. I baked baguettes a few times with a starter (levain), and quite unhappy with the results, the bread came out crunchy, then the crust would soften and become a little chewy (I hate chewy bread), and the inside was not airy enough, quite dense and that’s not a sign that the bread is right. I really don’t like heavy crumb, after a few bites, it feels you ate some iron. The taste was ok but not quite what I wanted and did not want to post something I thought was not right nor eat it. After constant searching, and reading boulangers sites like this one www.boulangerie.org and with their amazing recipes that I will try soon, I found another wonderful blog dedicated to baking called Le Pétrin, so for those of you who read French, I strongly suggest it, if you are in a baking mood and interested in bread-making. The explanations are very clear and precise and her breads, patisseries, croissants, brioches are just amazing. I realized that good bread-making takes time and the process is long, so I am afraid you just cannot cut corners. It has to do with all the chemical reactions involved with the flour, water, and yeast…and there is no way you can just make bread in two hours, or at least baguette. What I like about this baguette is that the bottom part is very crunchy, very well cooked, almost burnt and hard with a very nutty taste, that you get in well cooked in some breads. This mini baguette (20 cm) is made with a fermented dough made the night before, and mixed with a regular dough made the day you are actually baking the baguettes. 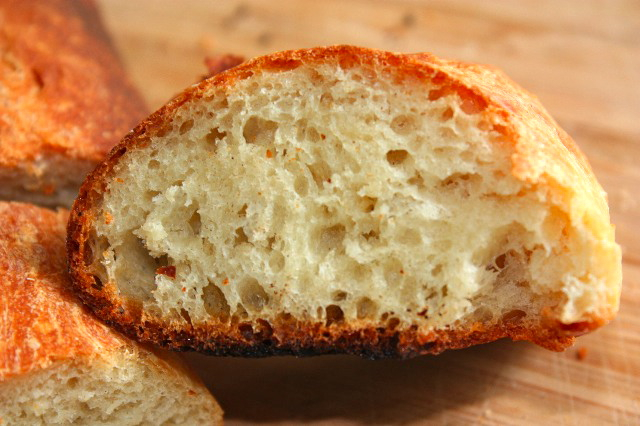 It makes the crumb (the inside part of the bread) very light and fluffy. This quantity is for 4 mini baguettes (about 20 cm long). There are so many recipes for baguettes, just because there are many kinds of baguettes, made with different techniques, flours, and so on, so this is one recipe among many others. You’ll have some fermented dough left, you can keep it up to three days in the refrigerator or in the freezer for 3 months. In a mixing bowl, mix flour with yeast, then add water and salt. Mix with a wooden spoon, then start kneading the dough for about 5-10 minutes until it becomes smooth and rubbery. The dough needs to be a little sticky when touching it. Start forming a bow, and place it in a container lightly oiled and allow the dough to be very slightly coated with the oil. Cover with a plastic wrap and let it rest for 1 hour. Quickly knead the dough to let the gas come out, then place back in the bowl and let it rest in the refrigerator overnight. Remove fermented dough and leave it at room temperature for one hour. Take the quantity you need and place the rest in the refrigerator well wrapped. Place flour in a mixing bowl with water and mix with a wooden spoon. Knead well until the dough becomes smooth but without too sticky. Cover the container and let it rest for one hour. 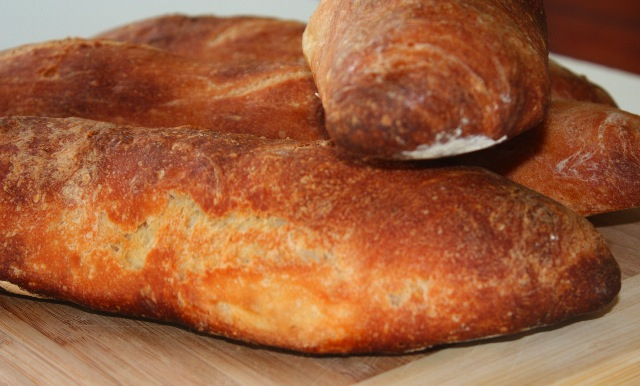 Mix fermented dough with the regular dough and add crumbled yeast, knead the dough. Add salt and water gradually and knead for 5 minutes until the dough becomes smooth and elastic. Cover the container with a plastic warp, let it rest for 1h30 and after 30 min bring both ends toward the center. Remove dough from container and lay on a floured working surface. Cut the dough into 4 pieces. Cover with a towel and let rest for 20 min. Take each piece and form baguette and place on parchment, thin extremities. Leave about 4 inches in between each baguettes. Cover with a towel for one hour. Pre-heat oven at 400F and place a small container like a cup (something that will handle that heat) in the oven while it’s heating up. When ready to place baguettes in the oven. Add water to the container so that steam will form and close the door immediately. 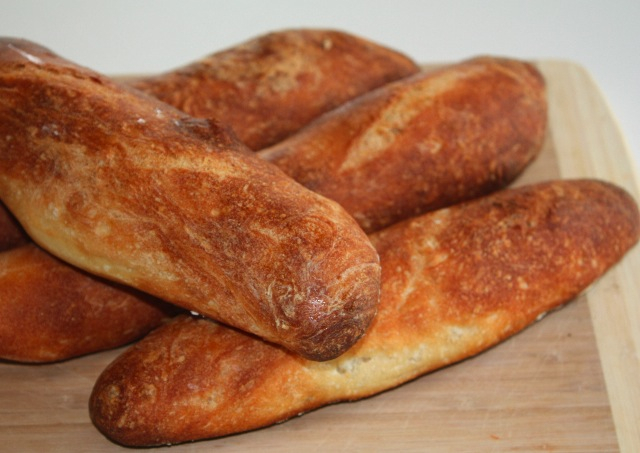 Make 2 cuts with a wet razor blade on top of the baguettes, then place them in the oven. 30 seconds later spray water on the sides of the oven to humidify bread. Close oven door quickly and let it cook for about 20 minutes or until baguettes have a golden color. Leave the bread for 5 min after the oven is turned off. This entry was posted by silvia on February 13, 2010 at 8:54 am, and is filed under Breads. Follow any responses to this post through RSS 2.0.You can leave a response or trackback from your own site. A ha! These are absolutely perfect looking! The crust looks amazing. This will be my next challenge for myself. it is very well done but sorry I love so much to go to the boulangerie of my neighbourhood that i buy my baguette !!!! Beautiful! I want to get back into the spirit of baking again soon. It’s been so busy lately, and when I’m baking things, it always feels like I’m truly enjoying the day. Love making bread. Love people that make bread. Love bread! Ohlala ! Il faut absolument que j’essaie cette recette… I looks really great and I miss a good baguette so much! !